When you think it might be time for you and your significant other to consider a will or other estate planning options, there are several important questions that you’ll likely have. Below are 10 of the key questions you should consider when you’re preparing wills and estate planning. What is the nature of your relationship? For example, are you married? In Colorado, the answer is not as clear as you may think. We are a common law marriage state, which means you may be married and not know it. (Click here for details of common law marriage in Colorado.) If you are in a civil union or an unofficial unmarried partnership, special concerns apply. An attorney can help you get to the bottom of this critical issue. Non-married couples may complete and record a designated beneficiary agreement to grant each other rights under intestacy, the right to act as personal representative and certain other rights. Is joint representation appropriate? If you have the same attorney prepare estate planning documents for both of you then you are waiving your rights of privilege and confidentiality. If there is a private request or information you do not want your spouse or partner to know, it is not appropriate to share the same attorney. Are there children from other relationships involved? Stepchildren and children from prior relationships bring unique issues to estate planning. For example, a parent may want their new spouse to have a life estate in an asset such as the home they bring into the marriage. However, that same spouse may want that home to go to his or her children from a prior marriage (rather than to the spouse’s separate heirs) when the spouse passes away. Documents such as a beneficiary deed can make this happen. Are there separate documents affecting estate planning? A prenuptial agreement, cohabitation agreement or even orders from a prior marriage may affect a person’s ability to plan the disposition of their estate assets. If you contracted to include someone in your will, for example, and fail to do it, then your estate could be sued for breach of contract upon your passing. So too, if you pledged an asset to your children as part of your divorce but then leave it to your spouse in your will, a lawsuit could take place as to whether your estate plan is contrary to court orders. In sum, related documents should be considered and shared with your attorney as part of a comprehensive estate plan. What are the tax consequences? Married couples benefit from a pass through allowing them to share their multimillion-dollar exemption from estate and gift taxes. Unmarried couples do not as a rule share this ability. You will want to discuss these issues with your estate planning attorney and also with your accountant or tax attorney. What is the status of your non-probate assets? You cannot overrule the disposition of your non-probate assets with a will. This means that the beneficiary designated in your retirement accounts, mutual funds and life insurance policy, will receive these assets upon your passing whether or not they are named in your will. Similarly, if your house is a joint tenancy with a right of survivorship, it will pass in its entirety to your spouse upon your passing regardless of what you state in your will. One man failed to remove his ex-wife as named beneficiary in his non-probate assets and she inherited $400,000 as a result. Learn from his mistakes. Do you need a trust? Many people do not need a trust. Many more can benefit from the residuary springing trust for minors, which I include in my wills as part of my original estate planning package. But there are others who do need a trust for a variety of reasons such as owning real estate in two states, wanting to protect an adult child from the influence of a parent from a prior relationship or wanting to control the disposition of a business. An attorney can direct you to what you need. An honest attorney will NOT direct you to more than you need. Unfortunately, many disreputable estate planners (many of whom are not attorneys) will oversell naïve individuals trusts they simply do not need. What about the elective share? In certain estate plans, a spouse may elect to inherit outside of the will in order to avoid taxes or for other reasons. This is a complex issue to be discussed with your attorney. Do you both want the same successor appointments? Many attorneys prepare “mirror wills” for couples, giving them all of the same appointments. This does not always make sense. A wife may want her sister to act as her personal representative if her husband predeceases her. Meanwhile, the husband may prefer his own brother (as opposed to his deceased wife’s sister) to fill that role for him. While considering these issues may not be the most pleasant thing in the world, it is worth considering and planning. Your attorney will participate and help you make practical, legally enforceable choices. When do you need to change your documents? It makes sense to review your documents annually if for no other reason than to make sure you remember where they are! At this time, look at the appointments and make sure they still make sense. You may have named your father as trustee but now his health is slipping. A simple codicil (sworn amendment to your will) can change this. If you got married or the nature of your relationship has changed, this requires a revision to your will and possibly other documents as well. Definitely, if you are divorced, you must change your will. Appointments and bequests to a former spouse become void by operation of Colorado law upon divorce. 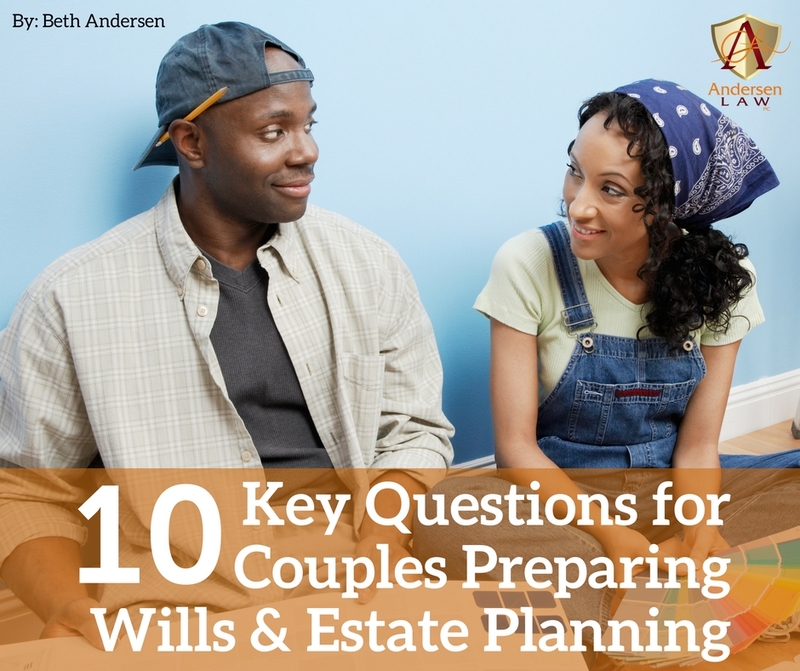 If you and your significant other have questions about wills or estate planning or feel like it’s time to get those documents created or updated, please contact Andersen Law PC. I offer affordable estate planning packages that will protect you and your spouse and ensure that your wishes are carried out. Contact me today at 720-922-3880 or beth@andersenlawpc.com for a free consultation.